The RSPCA has been campaigning for a better standard of living for small animals. We follow RSPCA guidelines regarding accommodation. As far as we are concerned the bigger the better. 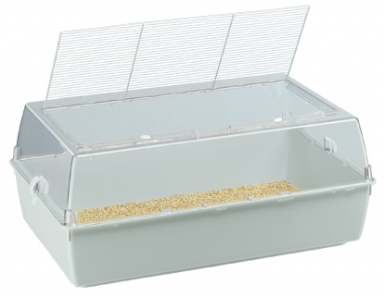 Cage size (approx) 3sq ft. (2ft6" or 73cm x 1ft3" or 38cm x1ft3" or 38cm on one level) OR (1ft3"or 38 cm x1ft2" 38 cm on each of 2 or more levels) This is for a pair of hamsters. Will substrate be kicked out of the cage easily? I personally will always choose a cage that will give my animals (hamsters or not) the maximum amount of space that I can allow for them. I know others do have limited space and can't offer their animals so much space, but so long as RSPCA guide lines are met hamsters will be happy. 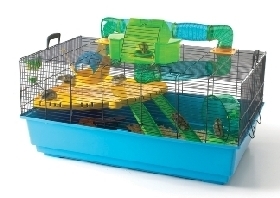 I have chosen a number of cages that I would hope be able to suit a variety of hamster owners. There are three types of accomodation I would say were suitable for Syrian hamsters. These are wire cages, moulded plastic cages and converted bin storage boxes. Wire cages, are most often seen on the market , although not many comply to RSPCA recommendations. Savic Cambridge (62 X 36 X 43cm) Has 2 levels. Well recommended on hamster forums and rightly so. 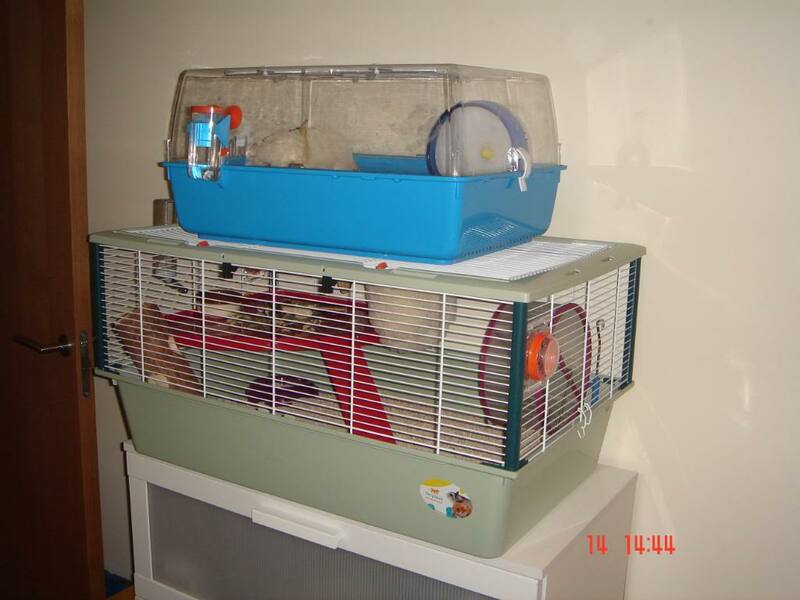 Although the wheel supplied is not big enough for a Syrian hamster, the space this cage allows is great compared to smaller wire cages on the market. It is easy to clean and can take quite a few toys and interesting thing to keep hammy entertained. As new you can expect to pay upwards of £55, although if you are lucky you can pick them up for a fraction of the price though online ads and auction sites. Comes with accessories, although the wheel, again is not big enough for a Syrian hamster and another wheel will be needed. It has a fully open roof rather than a little side door. This allows you easy access for cleaning or getting your hamster out to play. As it is barred on the top bit, other levels can be added at a later date. Can be difficult to fix together when it arrives. A complete package, when bought new, and gives hammy the more room offered by any hamster specific cage on the market. The hamster heaven is one of the more expensive hamster cages on the market at £95, however it does give the hamster much more space and a better quality of life. It has lots of floor space so can fit in plenty of toys whilst still having plenty of room to run around. It is a great height to be able to fit a larger wheel in. 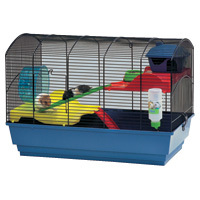 The bars are narrow spaced so ideal for dwarf hamsters / babies. The large grill is good for access, and also ideal for hanging hammocks or toys. This style of cage is of great benifit to owners with hamsters who chew the bars,no bars =no chewing, well of the bars anyway. Retails at approx. £40, is great value for money and cost effective for the amount of space it provides. However, it does mean spending money on accessories. As most hamster cages are supplied with wheels that are too small, I think it is something that you could live with. Bin cages are basically storage boxes converted to house hamsters. Bin cages are great, they can be fantastic value for money. All it takes is a bit of DIY and a few tools. The one used in the slide show is a 130ltr SAMLA from IKEA. It measures 79cmx57cmx42cm. In total the box itself cost £13.99. I am going to add shelves soon, and it will be ready for a hamster. Hover over the image will bring up rewind, stop and fast forward buttons to help slow the slide show down.